We hope that everyone enjoys this weeks basket as it is packed full with delicious vegetables. 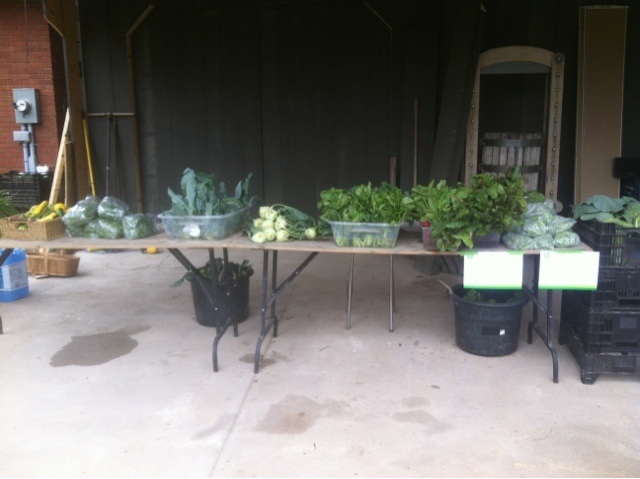 The table looks a little empty but we are not putting everything out to keep things as fresh as possible as people stop by the farm throughout the afternoon. If read the previous post this week about what might be going out this week I am pleased to say that it was all harvestable. We even harvested the first of the broccoli. I am planning on making a delicious cabbage , broccoli and radish slaw for supper tonight. Hopefully you all get to enjoy some delicious food as well! Pinsky Mortgages Vancouver is the most efficient means of rebuilding volume to faces or even hands that have deflated or misplaced body fat due to aging. It's used to “plump” the skin, so when positioned strategically-creates the “lifting” impact for any naturally more youthful look. Whenever combined with Botox Beauty, a non-surgical facelift is accomplished for ultimate face restoration.